Rezumat: Introducere – Prevalenţa afectării cardio-renale este în continuă creştere şi este însoţită de mortalitate şi morbiditate înaltă. Scopul studiului – Aprecierea prevalenţei afectarii renale la pacienţi cu insuficienţă cardiacă şi fracţie de ejecţie redusă şi intermediară. Material şi metode – Studiul retrospectiv a inclus 194 de pacienţi cu insuficienţă cardiacă cronică (ICC) cu fracţie de ejecţie (FE) redusă şi intermediară, spitalizaţi în perioada ianuarie 2014-decembrie 2015 în Clinica Cardiologie, SCM „Sfânta Treime”. Rezultate – Au fost evaluaţi 194 de pacienţi: 113 subiecţi cu ICC cu FE intermediară – 40-49%; şi 81 de subiecţi cu ICC cu FE redusă <40%. Rata estimativă a filtrării glomerulare (RFGe) – ≤60 mL/min/1,73m2 a fost înregistrată în 27,31%. Prezenţa proteinuriei a fost constatată în 54,72% cazuri dintre pacienţii cu RFG diminuată com-parativ cu 67,38% dintre cei cu RFGe ≥60mL/min/1,73m2. Concluzii – Rezultatele studiului confirmă că prevalenţa afectării renale în insuficienţa cardiacă este destul de înaltă, fie că ne concentrăm atenţia asupra RFGe sau a proteinuriei. The prevalence of cardiac and renal comorbidity is steadily increasing. Approximately 5% of emergency hospitalizations are due to heart failure, 20% of these patients presenting with renal impairment4. Renal im-pairment is the most common comorbidity in HF. On the other hand, cardiovascular mortality (CV) in pa-tients with chronic kidney disease (CKD) reaches 40 %5. In any context, cardiovascular impairment (com-bined heart and renal dysfunction) has high mortality and morbidity. Cardio-renal syndrome (CRS), in the absence of a generally accepted definition, was previously seen as renal dysfunction secondary to chronic cardiac dysfunction (eg. HF). This definition failed to explain the multitude of situations where cardiac and renal dysfunctions coexist. In 2008, Ronco et al. proposed dividing the syndrome into five types, classifi cation recommended in the report of the 2009 Acute Dialysis Quality Initiative (ADQI) Consensus Conferen-ce5, in order to emphasize the different pathogenetic pathways of CRS and to define primary or secondary organic dysfunction. The consensus group defines CRS as “heart or kid-ney disorder in which acute or chronic dysfunction in an organ can lead to acute or chronic dysfunction in the other”. This type of expression was chosen in or-der to explain the bidirectional nature and character of the disorder. Kidney impairment in patients with primary cardiac disease (chronic CRS, type 2). Multiple observational studies describe the coexistence of chronic heart failure (CHF) and chronic kidney disease (CKD), however study inclusion is usually based on the presence of one disease (eg. CHF), studying further the prevalence of the other (eg. CKD)2,3,5. A meta-analytical study on the interrelation between heart failure and renal disorder reported a 63% prevalence of mild and 20% moderate renal impairment. In addition, a 7% increase rate in mortality was observed for each decrease in eGFR by 10 ml/min 2,5. In the DIG trial, that assessed 7788 ambulatory patients with congestive heart failure, Campbell et al. found an eGFR < 60 ml/min/1.73 m2 in 45% of cases 1. Another study, focusing on ambulatory patients with congestive heart failure, found that 39% of patients with NYHA IV CHF and 31% of NYHA III CHF patients had severe renal dysfunction (creatinine clearance < 30ml/min)2. Bhatia et al. described a 45% incidence of decreased estimated glomerular filtration rate in patients with congestive heart failure with left ventricular ejection fraction impairment1. Cardiac impairment in patients with primary renal disease (RCS, type 4). The incidence depends on CKD severity and population risk. In the HEMO study, Cheung et al. found an 80% incidence of cardiac disease in patients with end-stage kidney disease 2. In the same study. a 3.7-year follow-up revealed a 39.8% rate of CV-based readmission to hospital (39.4% of them – CV related death). CV mortality in patients with CKD is 10-20 times higher compared to those with no CKD5. The NHANES study (17061 subjects) descri-bes a prevalence of 4.5% (eGFR ≥ 90 ml/min/1.73m2); 7.9% (eGFR 70-89 ml/min/1.73m2); 12.9% (eGFR < 70 ml/min/1.73m2). In the USRDS study of 1,091 201 sub-jects, Foley et al. describes an incidence of 4-7/100 patients/year for acute myocardial infarction and 31-52/100 patients/year for chronic heart disease1,2. The mere coexistence of cardiac and renal disea-se may confirm the presence of CKD; however, it is not sufficient to establish its type. According to the 11th ADQI Consensus Conference Working Group (2013), in order to confirm CKD diagnosis (except type 5) the following criteria are necessary: 1) coexistence of renal and cardiac disease in the patient; 2) temporary causality (eg. documented or assumed onset of heart failure precedes the onset of renal involvement); and 3) pathophysiological plausibility (eg. manifestation and degree of renal involvement can be explained by existing cardiac disorder)2.Study aim: To assess renal involvement (cardio-renal syndrome type 2/4) prevalence in patients with chronic heart failure with mid-range and reduced ejection fraction. Materials and methods: The retrospective study included 194 HF patients with mid-range and reduced EF (as defined in the 2016 ESC Guidelines for the di-agnosis and treatment of acute and chronic heart failure) hospitalized in the Cardiology Unit of Municipal Clinical Hospital „Sfanta Treime” during January 2014 – December 2015 period. We examined the following data: age, gender, disease duration, echocardiographic data and markers of renal function. Results and discussions: As an initial resear-ch step, we estimated the prevalence of cardiorenal syndrome in patients with mid-range and reduced ejection fraction heart failure. For this purpose, a pre-liminary retrospective study was carried out by exa-mining medical reports of patients with CHF, LVEF ≤ 49%, hospitalized in the Cardiology Unit of the same hospital in the period of time mentioned above. The mere coexistence of cardiac and renal disease may confirm the presence of CKD; however, it is not sufficient to establish its type. Given the retrospective analysis limited information, when the primary disorder cannot be assessed, we used the term CRS type 2/41. The data provided above denote a male predominance in the study with a 3:2 M to F ratio, and a predo-minance of urban residence – 82.99% of cases. Subsequently, we wanted to present the complex study group in terms of HF onset features presented in Table 2. Data presented in the table show that patients’ age at the time of research varied widely, ranging from 37 to 89 years, with a mean age of 66.56 years. We noted heterogeneity for disease onset, the onset age ranging from 6 to 86 years, while disease duration ran-ged from 0 to 50, with a mean of 11.56 years. 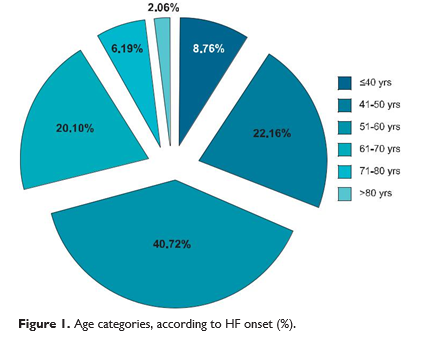 Next, we categorized patients by age according to HF onset. According to Figure 1, the age with a higher HF inci-dence rate ranged between 50 and 60 years (40.72%). Concomitantly, increased prevalence was repor-ted between 41-50 years with 22.16% patients, and between 61-70 years with 20.1% patients. Onset of heart failure by the age of 40 was seen in 8.76% of cases, and only 16 patients (8.25%) had the disease onset after 70 years. Assessing HF according to NYHA functional clas-sification, 20.60% patients had NYHA II HF, 59.80% NYHA II HF and 19.60% patients had NYHA IV HF. Over the past year, 15.5% of subjects required hos-pitalization while 12.4% of subjects reported weight changes. When studying patients’ past medical history, we found that 11.9% of subjects suffered from stroke, 39.7% of patients had AMI, sudden death in relatives was described by one patient only. Comorbidities were as follows: arterial hypertension in 84% cases, atrial fibrillation in 60.80% cases, diabetes mellitus in 26.30% cases, ischemic heard disease in 78.9% cases, rheumatic valve disease in 6.7% of subjects. 16.00% of study group patients were employed while 23.20% were unemployed, 3.60% had registered disability and 56.70% were retired. We performed a retrospective analysis of renal impairment prevalence in these patients. Of the 194 patients in the initial study group, 141 (72.68%) pati-ents had increased or within normal range CKD-EPI GFR – 85.65 ± 14.60 ml/min/1.73m2 (p < 0.0001), while 53 (27.31%) patients had decreased CKD-EPI GFR – 46.04 ± 12.99 ml/min/1.73 m2 (CI 35.1-44.12, p<0.0001). Using MDRD equation to assess GFR, we obtained a mean value of 85.42 ± 19.97 ml/min/1.73 m2 for the group with no CKD and 45.43 ± 12.48 ml/ min/1.73 m2 (CI 34.19-45.78; p <0.0001) for the other subjects. The results are shown in Table 3. According to the presented data, patients with CKD had a more advanced mean age – 71.94 ± 8.57 years, compared to the mean age of 64.53 ± 10.10 years (p <0.0001) of patients with no CKD. In addi-tion, patients with renal impairment age had a longer CVD duration – 13.61 ± 8.33 ani (p = 0.1) and a more advanced CVD onset age – 58.33 ± 10.87 years (CI 55.34-61.33; p <0.0001) compared to the rest of the study group – 11.17 ± 9.55 years and 53.36 ± 11.80 years, respectively. According to gender distribution, males prevailed in both groups at a rate of 56.6% in the renal impairment group compared to 65.96% in the no CKD group. In patients with CKD, proteinuria was present in54.72% cases with a mean level of 0.16 ± 0.32 g/l (p=0.0258) compared to 67.38% in those with eGFR ≥60mL/min/1.73m2 with a mean proteinuria level of 0.09 ± 0.14 g/24h. Table 4 presents patients’ distribution according to the degree of renal and cardiac impairment. As a result of renal parameters assessment, patients were divided into 5 groups depending on the CKD-EPI GFR accor-ding to KDOQI recommended stages of CKD (G1> 90 ml/min/1.73m2; G2 = 60-89 ml/min/1.73m2; G3a = 45-59 ml/min/1.73m2; G3b = 30-44 ml/min/1.73m2; G4=15-29 ml/min/1.73m2; G5 <15 ml/min/1.73m2) and depending on albuminuria level (A1 < 30 mg/g; A2 = 30-300 mg/g; A3 > 300 mg/g). Analyzing the formed groups, we noted an increased prevalence for G1A1– 23 (11.9%); G1A2 – 51 (26.3%); G2A1 – 28 (14.4%) and G2A2 – 49 (25.3%), corresponding to KDOQI CKD stages I-II. A lower prevalence was recorded for more severe forms of renal impairment: G3aA1 – 10 (5.2%); G3aA3 – 5 (2.6%); G3bA1 – 7 (3.6%); G3bA2– 3 (1.5%); G4A1 – 2 (1.0%); G4A2 – 4 (2.1%); G5A3– 1 (0.5%), corresponding to KDOQI CKD stages III-V, and also for normal or increased GFR cases with high levels of proteinuria: G2A3 – 8 (4.1%); G1A3 – 3 (1.5%) (Chi-squared – 18.63; p = 0.77). The data are similar to those obtained by Tan et al., who repor-ted a 20% prevalence of renal impairment in a cohort of patients with low LVEF (LVEF < 40% in over 78% of cases) and a mean age of 61.6 years 6. Ronco C. and Cruz D. reported a 63% prevalence of mild renal impairment and a 20% prevalence of moderate renal impairment in patients with heart failure with no LVEF categorization (1). Dig and Bhatia et al. trial found an eGFR < 60 ml/min/1.73m2 in 45% cases of patients with congestive heart failure with left ventricular ejec-tion fraction impairment2,5. The increased prevalence was also described by Lofman, who analyzed a cohort of 47.716 patients from the Swedish Heart Failure Re-gistry and found a 51% rate of GFR < 60 ml/min/1.73 m2 and 11% rate of GFR < 30 ml/min/1.73 m2 7. Gender distribution shows an increased prevalen-ce of mild CKD forms (G1-G2) among men (62.96%), advanced renal impairment forms being more preva-lent among women (56.25%). Subsequently, we evaluated the distribution of pa-tients with different degrees of renal impairment de-pending on the severity of cardiac involvement (II-IV NYHA functional classes). NYHA III HF predominated in mild renal impairment forms (G1-G2), while NYHA II and IV HF had a similar distribution in this group. The severe renal impairment group did not present any distribution patterns. Diabetes was found in 34% in patients with renal impairment and 23.4% in the control group (p> 0.05). According to the 2018 European Society of Cardiology data, 30-40% of the heart failure patients, regardless of LVEF, have diabetes. In the OPTIMIZE-HF study, the prevalence of diabetes was 42% in a cohort of 43,000 reduced ejection fraction HF subjects. (10) The Swe-dish IC registry data reported the diabetes rate in 21% in patients with renal function and 26-36% in those with reduced GFR. (8) The CHART study described diabetes in 17.1% for HF patients with GFR> 60ml / min / m2 and 21.9% – 28.1% for HF patients with GFR <60ml / min / m2. (9) The mean duration of diabetes was 7.05 ± 0.97 years for SCR and 3.48 ± 0.39 years (for those without SCR (<0.05)). Thus, in the present study diabetes is not an signifi-cant independent risk factor for cardio-renal syndro-me (RR = 1.44, p> 0.05); and may be explained by the short duration of diabetes, according to the literature data, in the natural course of diabetes, the risk of ne-phropathy is increased after 5 years. Bruno describes the occurrence of diabetic nephropathy at a duration of type 2 diabetes of 11.8 ± 7.8 years in subjects with normo-albuminuria and 10.0 ± 6.3 years in those with microalbuminuria. We continued our research by analyzing other risk factors. The hypertensions prevalence was 84.9% in the study group and 83.7% in the control group (p = 0.37). Thus, we cannot consider hypertension as risk factor for cardio-renal syndrome (RR = 1.07, p> 0.05). 20.8% patients from the control group and 8.5% of the control group had previous stroke; while history of myocardial infarction was reported by 37.7% patients with reduced GFR and 40.4% of those with preserved kidney function. Heart ultrasound is one of the diagnostic markers of cardiac damage and serves as a criterion for HF evolution and severity. In our study, we performed and assessed a total of 194 echocardiographic exami-nations. Upon reviewing the results, patients with re-nal impairment had a significantly lower LVEF – 41.68±5.11% compared to 49.00 ± 6.84% (p = 0.0022) in those with no GFR decrease. In order to confi rm the effect of low LVEF on CKD onset, we stratifi ed pa-tients based on LVEF according to the definition of heart failure: mid-range EF HF (HFmrEF) and redu-ced EF HF (HFrEF). We identified 126 subjects with HFmrEF (LVEF 40-49%) and 81 subjects with HFrEF (LVEF <40%). The mean age of patients with HFmrEF was 67.89 years. Among them, 49.6% were men. CVD duration was 12.68 years. GFR according to CKD-EPI formu-la was 72.37 mL/min/1.73m2, while renal impairment with an eGFR < 60 mL/min/1.73m2 was recorded in 30.15% cases (p = 0.5344). GFR calculated by MDRD formula was 72.41 mL/min/1.73m2, while moderate re-nal impairment with an eGFR < 60 mL/min/1.73m2 was recorded in 32.53% cases. Mean proteinuria level was 0.08 g/24h with a proteinuria prevalence of 62.8% in patients with HFmrEF and GFR ≥ 60 mL/min/1.73m2, and 78.57% in those with GFR < 60 mL/min/1.73m2. 79.4 mL/min/1.73m2, with a decreased GFR being re-corded in 22.55% cases (p = 0.5344). GFR calculated by MDRD formula was 78.35 mL/min/1.73m2, renal impairment being diagnosed in 25% cases. Average proteinuria level was 0.15 g/24h. The prevalence of proteinuria was 77.8% in patients with HFrEF and nor-mal or slightly increased GFR, and 100% in those with an eGFR < 60 mL/min/1.73m2. Next, we searched for correlations between HF de-gree, EF level and renal impairment degree, and tried to appreciate the diagnostic value of these parameters in CKD development. Correlation analysis results are shown in Figure 2. 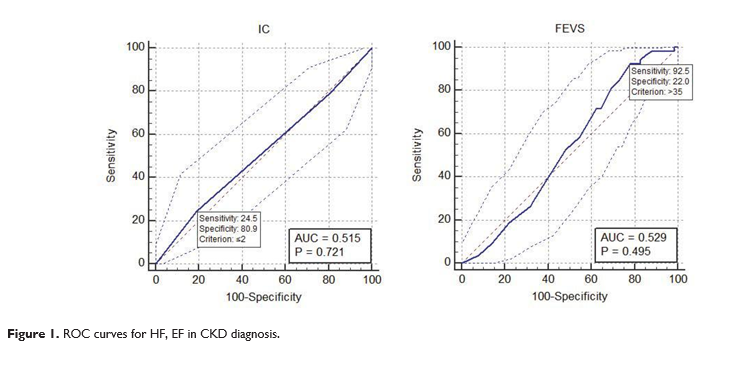 HF gravity did not correlate with renal impairment degree (r – 0.04, p = 0.55). NYHA I HF had a sensiti-vity of 24.5 and specificity of 80.9 (p = 0.72). For LVEF, sensitivity was 92.5 while specificity 22 (criterion > 35, p = 0.0.49). AUC (area under curve) is the mea-sure of a test performance. In order to have a reaso-nable performance, a test should have an AUC above 0.5. In our study, we got an AUC of 0.515 for HF and 0.529 for LVEF, represented graphically by secondary obtained diagonals, proving that LVEF level and HF de-gree are random tests for CKD diagnosis. The results of our study confi rm that renal impair-ment prevalence in patients with heart failure is quite high, whether we focus on eGFR or proteinuria. Both proteinuria and glomerular filtration rate are easy to assess and therefore should be investigated in all pa-tients with heart failure in order to stratify their risk and manage them more efficiently. Multiple studies have proven that renal impairment has an essential role in HF pathogenesis and evolution of, being an independent prognostic factor. However, to date, possibilities of establishing the exact origin and timing of renal changes onset in heart failure are limited. Moreover, there are no clear criteria that di-fferentiate a reversible, transient, renal dysfunction from a significant irreversible one. 1. Bagshaw SM, ”Epidemiology of cardiorenal syndromes.” Contrib Nephrol. 2010;165:68-82. doi: 10.1159/000313746. 2. Cruz D et al. “Pathophysiology of Cardiorenal Syndrome Type 2 in Stable Chronic Heart Failure: Workgroup Statements from the Eleventh Consensus Conference of the Acute Dialysis Quality Ini-tiative (ADQI)” Contrib Nephrol. 2013;182:117-36. doi: 10.1159/ 000349968. 3. Damman K. ”Renal impairment, worsening renal funcţion, and out-come în patients with heart failure: an updated meta-analysis”, Eu-ropean Heart Journal (2014)35, 455–469, doi:10.1093/eurheartj/ eht386. 4. De Vecchis R.”Cardiorenal syndrome type 2: from diagnosis to optimal management” Therapeutics and Clinical Risk Management 2014:10 949–961. 5. Ronco C et al. ”Cardio-renal syndromes: report from the consensus conference of the Acute Dialysis Quality Initiative”, European Heart Journal (2010)31, 703–711 doi:10.1093/eurheartj/ehp507. 6. Tan M.H., Glendon Lau S.K., Han W.H. WORSENING RENAL FUNCTION IN HEART FAILURE PATIENTS Kidney International Reports (2017) 2, S1–S41. 7. Löfman I., Szummer K., Hagerman I., Dahlström U., Lund L.H., To-mas Jernberg T., Prevalence and prognostic impact of kidney disease on heart failure patients Open Heart 2016;3:e000324. doi: 10.1136/ openhrt-2015-000324. 8. Prevalence and prognostic impact of kidney disease on heart failure patients . Löfman I., Szummer K., Hagerman I., Dahlström U., Lund L.H., Tomas Jernberg T.,. Vols. Open Heart 2016;3:e000324. doi: 10.1136/openhrt-2015-000324. 9. Prognostic Importance of Chronic Kidney Disease inJapanese Pa-tients With Chronic Heart Failure. Shiba N., Matsuki M., Takahashi J., Tada T., Vols. Circ J 2008; 72: 173 –178. 10. W. D. Comper, L. M. Hilliard, D. J. Nikolic-Paterson, and L.M. Russo, “Disease-dependent mechanisms of albuminuria,” American Journal of Physiology, vol. 295, no. 6, pp. F1589–F1600, 2008.